Sense, A Rosewood Spa at Paris is dedicated to the rich culture of the French esprit, tradition and l’art de vivre. The luxurious spa, located within the palatial and recently restored Hôtel de Crillon, A Rosewood Hotel, is an exquisite jewel added as a major amenity during architect Richard Martinet’s all-encompassing refurbishment. The complex is on the ground floor, where French doors lead you into the beautifully landscaped Cour Gabriel Courtyard before you indulge in one of the serene services on offer. 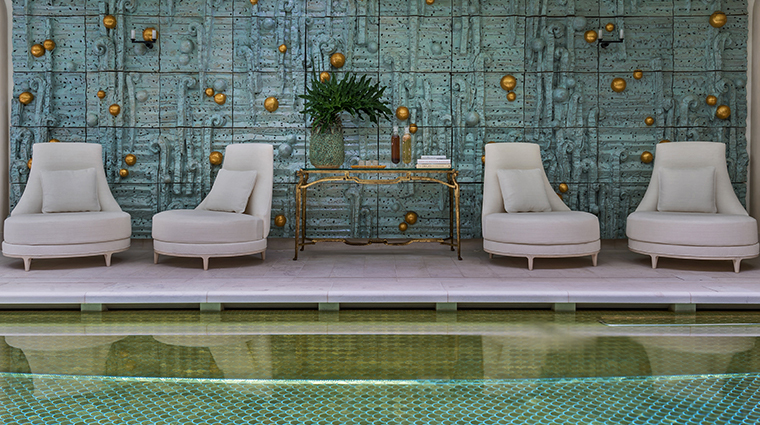 Follow interior designer Chahan Minassian’s stunning blue and beige mosaic-tile floor to the heart of the spa. The colors are repeated in crystal beads that decorate the ceiling fixtures and hang between wall lamps, creating an equally chic and soothing escape. The indoor pool is a style lover’s dream with three-dimensional Majolica-like blue walls that frame the water. Created by New York ceramist Peter Lane, the unusual surroundings give the otherwise plain space a modern edge. The 17,600 gold shell-shaped mosaic pieces on the floor of the indoor lap pool glimmer from sunlight reflected through the skylight on the terrace. Gents will find plenty of ways to be pampered at this Paris spa, which houses both a barbershop from La Barbiere de Paris and a leather-care boutique from Devoirdecourt. An intimate state-of-the-art fitness studio provides a great space to grab a workout, though yoga classes are also offered poolside on Thursdays with local yogi Nicole Marty. Luxe French products — including Evidens de Beauté, Les Luneides and Maison Caulières— are incorporated into body and beauty treatments for a true taste of Parisian luxury. For spa services or a swim, bathrobe-clad guests arrive from their rooms via a dedicated elevator. One of the professionals on the body service team is a Tibetan masseur who offers a unique massage. This is a technology-free spa, so leave your devices in your locker. The curated menu offers an assortment of anti-aging facials, including a high-tech Water Jet Peel, during which a strong oxygen spray renews cells and increases blood circulation. For the ultimate spa-to-runway experience, opt for the 210-minute Lights of Paris journey. The treatment starts with a rose water foot bath, followed by a moisturizing facial, manicure, blowout and a full makeup application. Fragrances of lavender, rose and peppermint enhance the traditional French (particularly Provencal) elements in some treatments, such asthe Anti-Migraine Ritual. Two of the four opulently appointed treatment cabins are on the ground floor; their paneled doors hide storage and drapes decorate windows. The deluxe “duo” suite boasts an updated edition of an Empire chaise lounge, a dressing table with an oval mirror, a private shower and toilet.